474 pages | 47 B/W Illus. 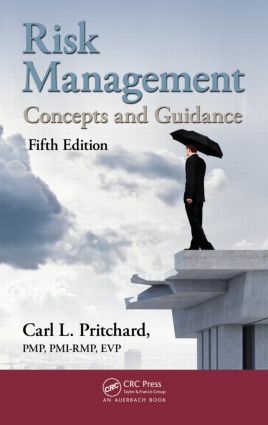 This new edition of Risk Management: Concepts and Guidancesupplies a look at risk in light of current information, yet remains grounded in the history of risk practice. Taking a holistic approach, it examines risk as a blend of environmental, programmatic, and situational concerns. Supplying comprehensive coverage of risk management tools, practices, and protocols, the book presents powerful techniques that can enhance organizational risk identification, assessment, and management—all within the project and program environments. Emphasizing greater clarity on risk practice, this edition maintains a focus on the ability to apply "planned clairvoyance" to peer into the future. The book begins by analyzing the various systems that can be used to apply risk management. It provides a fundamental introduction to the basics associated with particular techniques, clarifying the essential concepts of risk and how they apply in projects. The second part of the book presents the specific techniques necessary to successfully implement the systems described in Part I. The text addresses project risk management from the project manager’s perspective. It adopts PMI’s perspective that risk is both a threat and anopportunity, and it acknowledges that any effective risk management practice must look at the potential positive events that may befall a project, as well as the negatives. RISK PROCESSES AND PRACTICES: WHY RISK MANAGEMENT? Carl L. Pritchard is the principal of Pritchard Management Associates and is a widely recognized risk management authority and lecturer. He was the lead chapter author for the risk management chapter of A Guide to the Project Management Body of Knowledge (PMBOK® Guide), Fourth Edition. Mr. Pritchard’s publications include courses in risk management, The Risk Management Memory Jogger (GOAL/QPC, 2012), as well as Project Management: Lessons from the Field (iUniverse, 2009), The Project Management Communications Toolkit, Second Edition (Artech House, 2012), How to Build a Work Breakdown Structure, and Precedence Diagramming: Successful Scheduling in the Team Environment. He co-produced (with ESI’s LeRoy Ward) the landmark 9-CD audio collection The Portable PMP® Exam Prep: Conversations on Passing the PMP® Exam (Fourth Edition). He is the U.S. correspondent for Project Manager Today, a project management journal published in the United Kingdom. Mr. Pritchard also designs and develops project management programs and was the original architect of ESI International’s landmark offerings in project management in a distance-learning format. He is a trainer both online and in the classroom. In his role as lecturer, Mr. Pritchard speaks regularly at national symposia on project management and serves as the "speaker’s coach" for several national conferences, providing guidance on how most effectively to share the project management gospel. He is active in professional project management associations and is a certified Project Management Professional (PMP®), a certified Risk Management Professional (PMI-RMP®), and an Earned Value Professional (EVP), as certified by the Association for the Advancement of Cost Engineering (AACE) International. Mr. Pritchard earned a B.A. in journalism from The Ohio State University. Mr. Pritchard can be reached via e-mail at carl@carlpritchard.com.